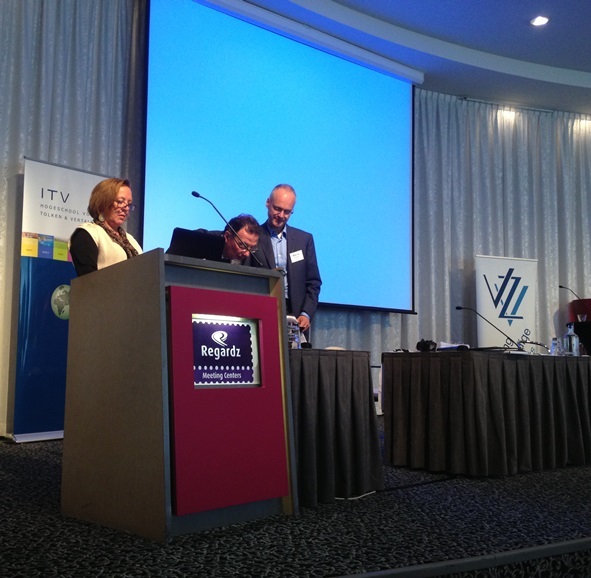 I recently had the pleasure of participating in the Nationaal Vertaalcongres 2013, the twentieth anniversary celebration conference for the Dutch training company Teamwork. The best part for me was that I could do so from home in another country. 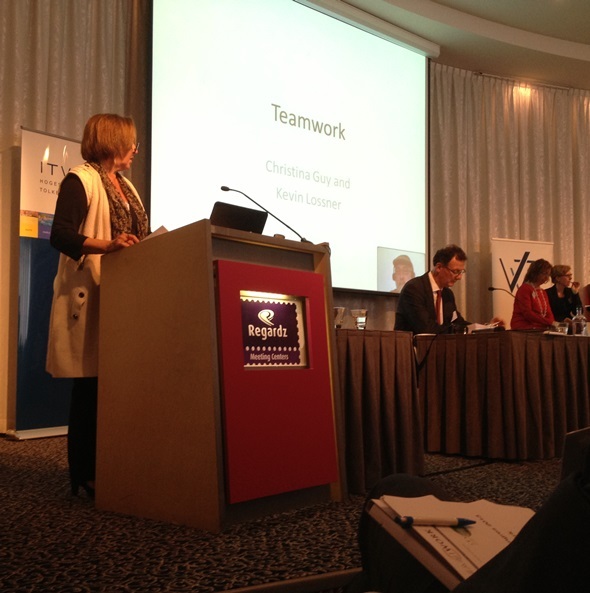 I was the remote half of a presentation at the conference by my colleague (Chartered Linguist) Christina Guy, a Dutch to English legal translation specialist and founder of Stridonium, a private site for professional exchange and support for translators now also exploring new alternatives for large project cooperation with its TagTeams to better serve translation buyers tired of being mauled by agency lions who often use inferior grades of "vendors" as so much cheap meat and try to hide the stench of their roadkill translations by redefining quality as whatever they can get away with. As part of the conference session on team collaboration, we demonstrated how we have used TeamViewer software in the past two years for troubleshooting, CAT tool instruction and work together on editing and copywriting projects. In our interactive TeamViewer sessions, we are able to view remote screens on any monitor of the presenter's workstation, switch the presentation from one workstation to another, use audio to discuss the project, send text messages in a "chat" field and even allow the other person to exercise remote control of a presenting workstation. 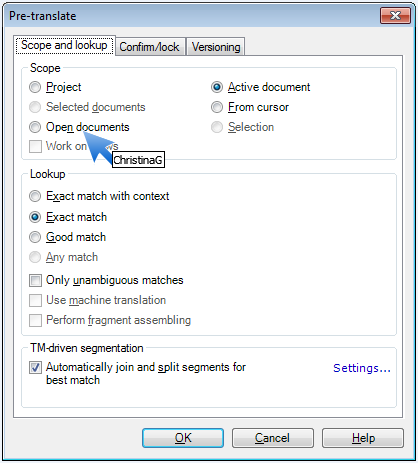 When the person viewing a remote screen wants to indicate some part of the screen requiring attention, a click at that spot causes a big blue "nag arrow" to appear (as it does in the screenshot of the pretranslation dialog for memoQ shown above). This has been very useful in tutorial sessions I have conducted for a number of people. Christina's presentation showed how TeamViewer served as a critical tool for overcoming many challenges for working together interactively on projects over great distances in a way less likely to light fuses through misunderstanding a description or question. We showed brief examples of tutorial exchanges, review of a bilingual press release and work on a PowerPoint presentation - just a few of the many tasks for which TeamViewer has proved useful. Judging from the comments she received about her presentation afterwards, the idea was extremely well received. I am, on the whole, quite skeptical of online presentation formats, particularly the much-loved "webinars". Certainly I have seen a number of excellent web-based presentations, and the opportunity to watch the masterful staging of such events behind the scenes with Kilgray's head of development, Gábor Ugray some months ago did a lot to address my objections and increase the likelihood that I might use conventional webinars as a communication vehicle myself some day, but on the whole, TeamViewer is a tool more to my taste. The logistics of using it are much simpler, and I feel it allows more focused, personal and effective presentations that fit the way I like to work and teach. Someone familiar with the Citrix presentation technologies and TeamViewer would probably object that I am not really comparing like with like here, and that objection would be correct. The real point is that I prefer more spontaneous, personal interaction with individuals or a small group, and TeamViewer is better suited to that. TeamViewer played an important role in the development of many of the tutorials in my book of memoQ tips, and after the many good experiences using it to work with Christina and others it inspired me to develop some new approaches to software tutorials for corporate clients. I think that today's presentation at the Nationaal Vertaalcongres 2013 may inspire the translators in attendance to explore possibilities for using this tool to solve their own remote communication challenges. Why not try it yourself? It takes just a few minutes to download the software, and use for non-commercial purposes (like explaining some hellish Trados import filter to a bewildered colleague) is free. 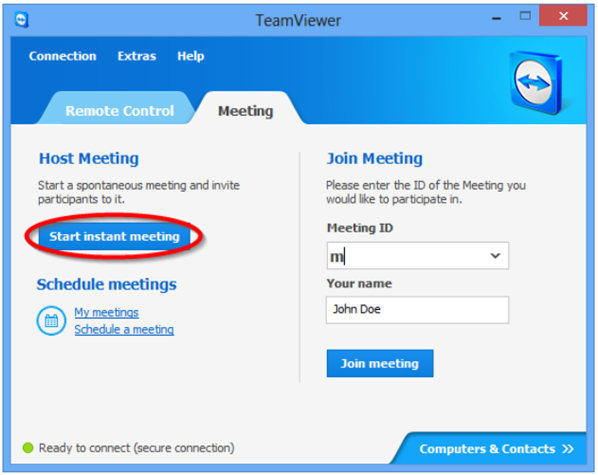 Go to the TeamViewer site to download it or see the many options available. The professional translators' group Stridonium is organizing a networking event on June 17, 2013 in Holten (NL) to teach translators in legal, financial and other domains the effective use of text collections (corpora) for identifying important terminology. The NIFTY corpus methodology uses specialized texts compiled by translators themselves to find appropriate terms in the target language, in particular types of text (such as joint venture agreements, offering circulars, divorce decrees or any other). The methodology applies to all language pairs and has been developed for efficiency (requiring on average 30 minutes) to meet the needs of working translators. Further details on the workshop and registration are available here.